Sometimes my Muffin Tin Monday posts are all cute and awesome in my head. I get all excited and just know I'm going to create something wonderful for my child. And then I actually make them and...well....they don't turn out. But food is food and I guess (hope) that Pierce isn't too disappointed when he opens up his lunch to find some strange alien creation that was supposed to be a four leaf clover in the grass. Uh huh. So for Pierce's "St. Patrick's Day" lunch he had an egg that most definitely DID NOT look like a four leaf clover in roasted seaweed that most definitely DID NOT resemble a field of grass. Strawberries in a heart cup, a mint Yoplait yogurt parfait, and a mini cheese sandwich that DID NOT resemble white clover. He did eat it all except the roasted seaweed. Can you say MOM FAIL? 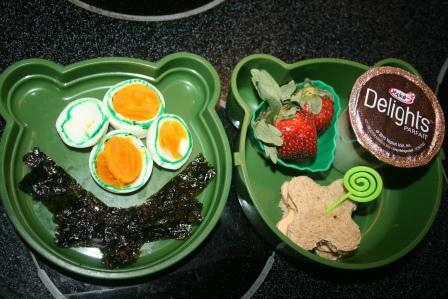 For more successful and way cuter lunch ideas for kids, check out Muffin Tin Mom. Out of the million adorable, creative lunches you make, you are entitled to one not stellar lunch. Any child would LOVE to have you packing their lunches! I think it's a great attempt and I quite like the white clover! You're so funny! I think he'll probably just remember that his mom took the time to pack him awesome lunches though, and he'll forget all about the not-so-clover-like eggs. His lunch looks healthy and tasty. And yum! Strawberries! Well, you SUCCEEDED in making me laugh!! I love your abstract interpretation of Irish symbols. It sounds like Pierce did too. Hee hee - I think we all have days like that! But you know what? He ate it all - that's no fail at all! You did not fail! Your child still ate and still appreciated :) Roasted seaweed sounds interesting, never tried it! I am sure he really didn't notice imperfection. I cannot say Mom Fail here...Your kids get the most fun meals! Even if it didn't resemble what it was suppose to resemble, it still looks good to me and I bet Pierce loved it. That's not failure. That's adaptation! I agree with commenter above. Your son will remember the time and creativity you put into his lunches and the yummy food you provided. ha ha. too cute, lisa. Dont feel bad, Lisa! I have the same issues. Most of the time my food tastes good, but it does not always look good. I tried a crock pot potato recipe last Saurday that was a flop. Funny think is I think it is a good recipe and I am willing to try again. Just with a little different angle. Good Luck with your next cooking project! Your failures are still better than most people's successes!!! I am so impressed with your creativity and imagination and I think you are a roaring success! It was a good effort at creativity though! HAHA- YOU MADE ME LAUGH! I needed that this morning! Those tins are just so cute. How the heck can you think of such creative ideas. I am envious! That is most definitely NOT a mom fail!! You made the effort and, for that, you deserve a gold star!!!! Hey, don't think you failed...did the kids like your creations? THAT is all that matters and the thought that they know you love them so oh well...life goes on! Not a fail...just great creativity! Lisa, I think it's cute! Not a fail at all! You won after all, cause he ate it all up! You know Lisa, you've got me now wondering if Pierce's teachers are always waiting eagerly to see what you have packed for him to eat everyday! roflol I can just see them now! lol At least you tried! It's still cute anyway though. Love the bear head container it was in! This was so cute! These post always make me smile because you are so creative! I would say that the fact that he ate most of it makes this a mom success!!! Hey it was still fun for the kids, even if it wasn't what you invisioned. I would still give you an A =)....Your such a good little Mommy! It's really the thought that counts, dearie! Looks great to me!